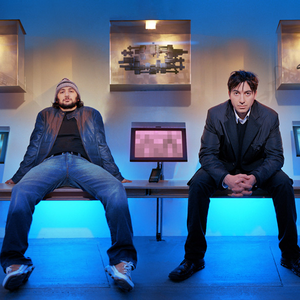 Iranian-American dance music production duo based out of Washington D.C., USA, consisting of Ali "Dubfire" Shirazinia and Sharam Tayebi. Originally known as club DJs, they have also released a long library of remixes and original productions. They own and operate the Yoshitoshi record label and have worked extensively with vocalist Morel. Their remix of Dido's "Thank You" won them a Grammy Award. The Iranian/American singer of three songs (Say Hello, Flashdance, Awake Enough) on the album George is on, is Anousheh Khalili.